Home / Essays / Martinez, Joann S.
Mesothelioma. Perhaps the only time you may have heard of this term is during one of those commercials paid by an attorney or law firm hoping to make some money on innocent individuals that have unfortunately been exposed to a dangerous element called asbestos. According to the Malignant Mesothelioma Help Center Mesotheliomahelp.tv, asbestos is a group of strong and elastic minerals that have been mined through out history for its fire retardant properties. While asbestos is banned in many countries, there still exist many countries in the world that still mine it today, regardless of the dangers associated with asbestos exposure. Asbestos is made of multiple tiny fibers that can be spun and woven together, and is not only extremely resistant to chemicals and heat, it is also very strong and flexible. Most people who develop mesothelioma in their latter part of life had previously worked on jobs where they were exposed to asbestos without protection. When inhaled, these dangerous particles become lodged in a persons lungs. The lungs then become inflamed, leading to chronic infection and mesothelioma. As stated in Mesothelioma America, “Asbestos companies deliberately hid this information, conspiring amongst themselves to deceive consumers by releasing fake medical tests illustrating the use of their products as safe. Yet doctors who made their own investigations on the health problems experienced by workers in asbestos companies pursued through the years by publishing articles on their findings. But it was not until 1971 that the Occupational Safety and Health Administration (OSHA) set the limit for acceptable levels of asbestos exposure in the workplace.” Unfortunately, it was too late for some of those whose lives had already been claimed by this deadly disease. These are the lives of the hardworking men and women who labored earnestly to provide for their families. These are people who worked in mines, shipyards, engineers, steel workers and auto mechanics. As they struggled everyday to feed their families they were unaware of the hazards of asbestos that would eventually claim their lives and the lives of their loved ones. Mr. J.R. O’Connor was one of those men. In October of 2001, he was diagnosed with mesothelioma. As one ventures into the personal writings of Mr. O’Connor, we are privileged to enter his mind momentarily as we are taken on a voyage alongside him which initiates with the callous manner of the physician that provided him with his prognosis, all through his new-found world of questioning, researching and studying. Mr. O’Connor’s attitude throughout this strenuous ordeal is quite impressive. In the first couple of chapters of his book, “They Said Months, I Chose Years,” one can lose count of how many times he said things like, “I really wasn’t worried..”, or, “I knew I could conquer it.” At first glance, the reader would expect the book to be a tear jerker, rather you are made to feel quite empowered, optimistic, even. This makes sense! You would think that this type of thinking would be common, and would be taught to practitioners and patients alike, but unfortunately, they are not. Why?! Mr. O’Connor makes a very valid point: “The answer is economic!” Of course. The FDA will only approve those meds after a drug company invests an estimated $500 million to make the treatment through clinical trials. Drug companies, however, will only invest that much money in treatments they can patent! Prior to this book, I would have crawled under a rock with my prognosis in hand, and just counted down the minutes until my given one month was up. I would have been guilty of what Mr. O’Connor speaks against: “No matter how confident you are, if you have no information or the wrong information you will make poor decisions.” All of my trust would have been put in to my physician, and all of the conventional western medicine ideals. I would think, “After all, these are all very intelligent people, of course my best interest is in mind.” The wool over my eyes has been diminished and I thank Mr. O’Connor for his courageous, pioneering ways. Having been equipped with his research and findings, his courage and ambition, I will never blindly and readily embrace anything that is ever said to me without taking my own life (and that of my family’s) into my own hands. Although we live in an age that is ever so progressive, it is unfortunate that our minds can be so one-dimensional. We will fight so many other causes and refuse to take no for an answer, yet when it pertains to the most precious thing: life, we are willing to simply lie down and die. I now know that there are options. I am eager to learn more about alternative methods. In the future if I were to face the same dire situation as Mr. O’Connor, I would take similar, if not identical action. Seeking the second, third even fourth and fifth opinions of other healthcare providers as well as various medical theories. Intense research on alternative cancer therapies and supplementing with vitamins, minerals and homeopathic supplements would be something I would definitely embark on. It is advantageous to seek the type of therapy that would best suit my individual body and health. Receiving an accurate analysis of my system and its strengths and weaknesses would be my first step. From that point of learning the reality of my assessment, I would work collaboratively with a team of individuals each doing their part to increase the quality and the length hopefully, of my life. 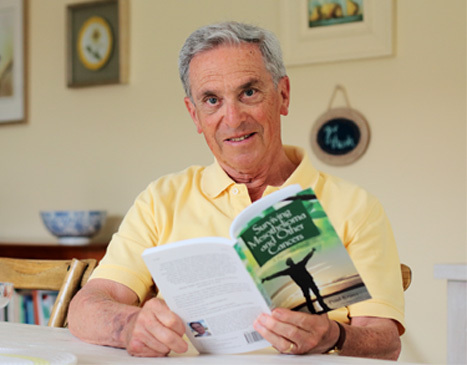 I would re-read Mr. O’Connor’s book and the writings of Paul Kraus, another mesothelioma survivor who continues to do well eleven years after being told he had less than a year to live. I would make radical changes to my lifestyle. I would read soul-soothing books, and listen to soul-soothing meditations. I would tap into my body’s self-healing capacity. I believe that perhaps I wouldn’t discuss my situation too much with my family, who tend to have a bit more than average of negative based energies. I would remain as optimistic and at peace as possible. Juicing, detoxifying and cleansing would be next on my list. Exercise would definitely be essential, as well as prayer and support groups. It would be my mission as well to share my findings with any and all that would listen. Mr. James “Rhio” O’Connor: A real trail blazer. A man whom perhaps was facing the largest giant in his life, stared his enemy in its eyes and proclaimed, “You may offer months, but I choose years. you may proclaim death, but I choose life!” His life and his legacy have become a bridge of hope for others to walk on; a stream of peace for other to drink from. This man and his mission are to be applauded and reverenced for the courage, conviction and hope that he has offered to the world. What Mr. O’Connor has left us with is definitely Hope from a Hero.